The postman just delivered this rather fine postcard. It features an unidentified windmill and a dog taking some Dutch children for a ride in a cart! Mailed in 1953. 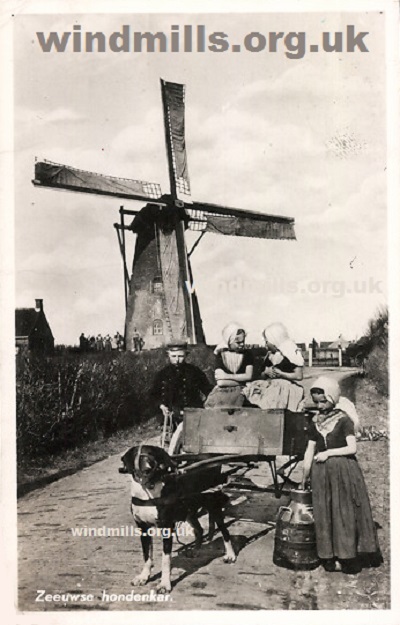 A 1950s postcard featuring a Dutch windmill and dog cart! Another picture of a dog cart and windmill from our mills archive. See also our page of old picture postcards of windmills in Holland. This entry was posted in Old Images, Uncategorized, Windmills and tagged dog cart, holland, postcard, windmill on April 1, 2014 by Tower Mill.